Three channel simultanous video playback (no audio) with 1x, 0,5x, 0,33x and 1.25x speed. Speed change during playback. Buy Multi Slow Motion HD Now! When something interesting happens in playing field editor stops video buffering and all camera buffers (4-18sec) have automatically saved to fast SDD M.2 disk. 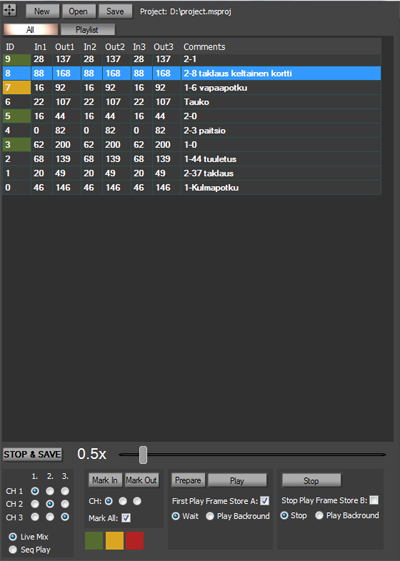 After saving video playback is ready to slow play and changing in/out points and camera angles. Events list table have is in/out points and comments for event. Playback can be live playback with instant camera angle change or sequenced play. You play different camera angles sequenced. 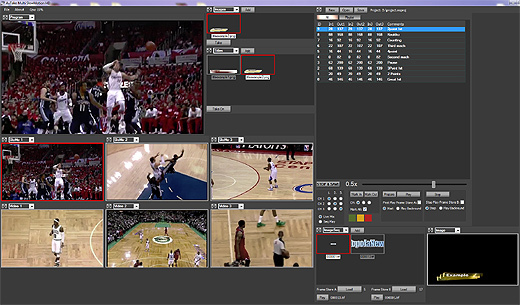 Video playlist table is used to play free sequence of different clips from different camera angles. This is suitable to play multiply event sequences with in/out points and comments for events. 3pcs Blackmagic Design PCI-E I/O for live inputs, one for output (Total four video devices). Decklink DUO and Quad I/O series cards are supported with input loop to output. Graphics card with hardware based DirectDraw overlay with 32-bit color. Intel i7 processor integrated craphic adapters also supported. Two port display adapter is required to preview full screen video. SSD for Windows drive, 7200RPM hard drive for backups. Copyright Avtake Oy 2017. All rights reserved.